Liam Neeson is back in action in the gritty crime thriller Run All Night (Warner, Blu-ray, DVD, VOD), his third and most satisfying collaboration with filmmaker Jaume Collet-Serra (Unknown, Non-Stop). Neeson once again has a very specific skill set—his nickname isn’t Jimmy the Gravedigger for nothing—but he’s been pickling it in booze for years to drown the guilt of his mob assassinations for Irish crime boss Ed Harris. Then Jimmy’s estranged son Mike (Joel Kinnaman), a former boxer turned limo driver, lands in serious trouble when his job takes him to the wrong place at the wrong time where he witnesses a gangland murder. Jimmy sobers up quickly and takes on his former boss and best friend—not to mention the bad cops in his pocket—to do protect his boy. In the world of high-concept crime thrillers, this is surprisingly down to earth. There’s no superheroics or spectacular Die Hard-style stunts here. It’s all handguns and car chases and blood and broken glass on the urban mean streets at night, and Collet-Serra creates a very turbulent, unstable ordeal. Things move fast and the violence comes abruptly, and the atmosphere is tense and jittery. It lives up to the title. But Collet-Serra also grounds it in actual relationships—a son who has no respect for a drop-out father, a mobster who respects his alcoholic best friend more than his reckless son, who would rather play gangsta than understand the balance of power and diplomacy in the criminal underworld, and two fathers who will do anything for their sons despite the past. It’s reminiscent of seventies crime picture, with corrupt cops and criminal codes and a new generation of thug that has no respect for the old ways. If it never becomes anything more than a great paperback crime yarn built on coincidence, bad luck, and blood ties, it does the genre proud. Vincent D’Onofrio brings a weary gravitas to an old-school police detective whose sense of justice outweighs his desire to put Jimmy down and Common is enigmatic as a hired gun with his own specific skill set. On Blu-ray and DVD with two featurettes and deleted scenes. Also on Cable On Demand, Amazon Instant, Vudu, Xbox, and CinemaNow. Do not doubt Liam Neeson. This lesson from the recent string of action movies starring the 61-year-old actor is reinforced by Non-Stop, a bang-up thriller with Neeson as the lone hope for a plane full of innocent passengers and a crazed hijacker. 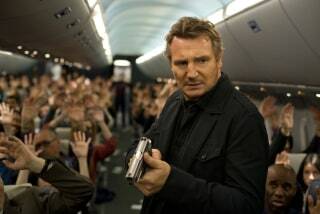 Seriously: If I’m on a flight and bad stuff is going down, I want Liam Neeson there. Dude is so gigantic and forceful he looks like he could land the plane by carrying it on his shoulders. Sam Raimi always wanted to make his own superhero movie. It was a natural fit for the director, as the Spider-Man films so clearly prove, but in 1990 no one was ready to trust him with a comic book hero on the strength of a couple of Evil Dead movies. So he created his own character: Darkman, a disfigured, damaged scientist who emerges from a fiery original story with one foot in the world of Gothic horror and the other in Hollywood action cinema. Liam Neeson is Peyton Westlake, a scientist working on the experimental “liquid skin” in a laboratory built out of a waterfront warehouse. He lives with Julie Hastings (Frances McDormand), an attorney representing a shady developer (Colin Friels) whose trail of bribes starts to surface. When he sends his thug Durant (Larry Drake), a beady-eyed heavy with a jowly face, a posh sense of fashion, and a pocket cigar cutter that doubles as a portable guillotine for the fingers of his victims, to grab the incriminating documents, Peyton and his lab assistant become collateral damage. Darkman was Raimi’s first studio film and, while hardly a big-budget project, he had more resources at his disposal than he had ever had before and he celebrates with a big, busy opening scene of gang warfare. Raimi lets us know exactly what kind of film we’re in for in the first scene, where a gang stand-off becomes a massacre after Durant’s men pull out a machine gun hidden in prosthetic limb.